Back in February, Maker Series took a break from software and dug into wearable hardware. Girl Develop It co-founder and CEO of Jewelbots Sara Chipps brought her knowledge and experience building Jewelbots—a wearable friendship bracelet that encourages young girls to learn how to code—to a great introductory class on wearables. Each attendee received a kit that included an Arduino Gemma, a few LEDs, and a spool of conductive thread to craft his/her masterpiece. Workshop attendees came from a diverse range of backgrounds that included web developers, work-at-home moms, a large group of students from DECA and Ponitz high schools, college students, and more. Amongst them were people who knew how to code and wire circuits but had never sewn before. Others, however, had been sewing for years but had no knowledge of circuits. This made for a very collaborative day with everyone working together to figure out how to best sew in the circuit and get the code running on the Gemma. Prior to the workshop, attendees were advised to bring in an article of clothing or other accessory to sew the Gemma and LEDs into. One attendee brought in princess costume dresses and sewed in LEDs that lit up to the tune of “Hot Cross Buns”; one dad enhanced his daughter’s already sparkly Hello Kitty jacket by sewing in circuits for a more flashy effect; a Sparkboxer sewed LEDs into his laptop sleeve; and some people brought running hats to sew in LEDs. The second half of the day was dedicated to questions, a majority of which were about the whole process of starting a business and funding it on Kickstarter. Sara has had great Kickstarter success funding Jewelbots, which is dedicated toward drastically changing the number of girls entering STEM fields using hardware. Sara offered a wealth of information and talked about the entire process of funding Jewelbots on Kickstarter, from developing a product and prototyping it all the way to consumer testing and manufacturing. From her experiences, we learned that running a successful Kickstarter campaign isn’t as easy as it seems and is a full-time job that takes months of planning and careful execution. If you’re interested to learn more about the process, Sara wrote an insightful and deeply informative post on the topic on Medium. This year's Maker Series lineup has been crafted to stretch attendees beyond the more typical technical presentations we've done in the past. 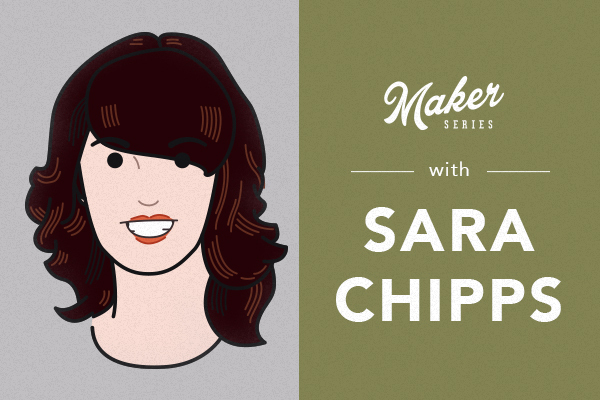 Sara kicked off the Maker Series this year by challenging us to break away from our screens and build right off-screen. Everyone had a great day and walked home with some fun new toys and knowledge to share.